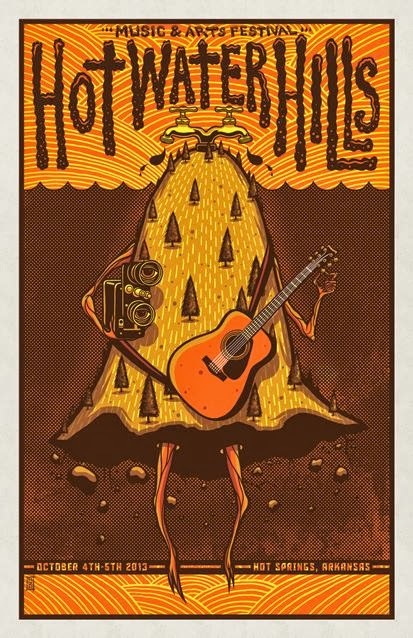 The third annual Hot Water Hills Music and Arts Festival will be held October 5-6, 2013. The location will be Hill Wheatley Plaza on Central Avenue in downtown Hot Springs. Hot Springs is known for “quirky” events, and Hot Water Hills fits into that description. Visitors will find music, arts, food, drink, family activities and contests. What sets Hot Water Hills apart is its focus on sustainability. The 2012 event earned a Zero Waste Certificate from Keep America Beautiful by recycling, using solar power, and the Cardboard City contest. This year’s contest will take place on Saturday, Oct. 5. Teams will compete for cash prizes by designing and building cardboard structures made out of only cardboard, twine and tape! Music is of course the highlight of the festival. Headlining this year’s event will be Arkansas’ own Adam Faucett and The Tall Grass. Other performers include the Memphis Dawls, Telegraph Canyon, Luella & The Sun, and Arkansas native AJ Gaither. Check the schedule for a complete list of performers. A new event this year will be the Retro Rummage Sale starting at 4pm Friday and noon on Saturday. Artisans will be selling their own creations at the Handmade Art Fair. Artist workshops will also be available, and there will be a pop-up skate park set up from 12-4pm on Saturday. Admission is just $5, so make your reservations at our Hot Springs bed and breakfast and spend the weekend enjoying the quirks of Hot Water Hills! This entry was posted in Events, Hot Springs Entertainment, things to do in Hot Springs by admin. Bookmark the permalink.